To Cite: Dana N, Tajaddini M H, Haghjooy Javanmard S, Jafari E, Abed A, et al. Cannabis sativa Extract Reduces Cytoskeletal Associated Proteins in Breast Cancer Cell Line, Int J Cancer Manag. 2017 ; 10(5):e5474. doi: 10.5812/ijcm.5474. Background: Previous studies suggested that Cannabis sativa has anti-cancer properties influencing tumor size and metastasis properties. Microtubule associated proteins (MAPs) such as tau binds to the microtubules and leads to cancer metastasis. Stathmin is a cytosolic phosphor-protein which can induce the depolymerization of microtubules in cancer cell lines, stathmin and tau over expressions, and leads to reduced sensitivity to taxane. It seems that C. Sativa can impress microtubule-associated proteins existing in breast cancer stem cells. Objectives: The effects of the extract of Cannabis Sativa on stathmin and tau relative gene expression were studied. Methods: Tau and stathmin relative gene expressions were evaluated at different concentrations of C. Sativa extract (final concentrations 0.1, 1, 10, and 100 μg/mL) using real-time quantitative PCR. In order to understand the mechanism, AM281 (Cannabinoid receptor 1) was administrated with extract too. Results: The extract exhibited significant differences (P < 0.05 and P < 0.005 respectively) in tau and stathmin relative gene expression with the doses of 100 μg/mL compared to control group, the mixture of antagonist AM281 and extract reversed the results. Conclusions: C. sativa extract dose-dependently influences tau and stathmin relative gene expressions, which may reduce cancer metastasis. One of the most common malignancies in the world is breast cancer. Although the prognosis for breast cancer has been progressed in recent years, drug resistance is still a problem (1-4). In the 1990s, taxanes became widely applied in breast cancer treatment; however, recurrence and metastasis still happened due to the cancer resistance of taxanes (5). Bone is the most common site of breast cancer metastasis (3, 6). Intervention of taxanes, with spindle microtubule dynamics, leads to cell cycle arrest in G2/M phase, followed by apoptosis. Microtubule associated proteins (MAPs) introduced as endogenous regulators for microtubule stability, promotion or inhibition microtubule polymerization and subsequently cell cycle progression or mitotic arrest (5-10). MAP-tau is expressed in normal breast epithelial cells and breast cancer, and its gene is located in the long arm of chromosome 17. This protein is the best microtubule stabilizing protein that functions to bundle, space, and assemble microtubules. Tau can bind to the inner and outer side of microtubules, and compete with taxane for binding to the same site at the inner side of the microtubules which may lead to a taxane-resistant phenotype. Loss of tau expression may lead to microtubule susceptibility to paclitaxel-induced damage (5-7, 9, 10). In the gene expression assay of human breast cancer, tau can serve as a new biomarker for predicting sensitivity to chemotherapeutic agents (5). Modulation of response to taxanes by reduction of Tau expression remains a very interesting phenomenon (11). Stathmin (also called Op18 and p19) is a cytosolic phosphor-protein which phosphorylate in response to various extracellular signals such as cell division and differentiation. Stathmin can induce the depolymerization of microtubules in vitro and in vivo, due to its phosphorylation-state. Proper assembly of the mitotic spindle requires desphosphorylation and inactivation of stathmin before cell entry into mitosis. Because of the ability of stathmin to remodel microtubule, stathmin has an important role in tumor cell migration and invasion. In breast cancer cell lines, stathmin overexpression leads to reduced sensitivity to taxane due to delayed entry into mitosis (12-14). Microtubule associated proteins (MAPs) may be related to varying therapeutic response rates in breast cancer patients and resistance to taxanes. Cannabinoids are a group of 21-carbon-containing terpenophenolic compounds produced by Cannabis species. Cannabis sativa may cause antitumor effects by various mechanisms, including inhibition of cell growth and tumor angiogenesis invasion, induction of cell death, and metastasis (15-18). There are two receptors associated to Cannabinoids (CB1 and CB2) which may be potential targets in breast cancer (19, 20). Studies have shown that the cannabinoid receptors CB1 and CB2 are overexpressed in primary human breast tumors compared with normal breast tissue and cannabinoid receptor agonists inhibit breast cancer cell growth and metastasis in vivo (1, 4). According to evidence, THC (Tetrahydrocannabinol), a natural component from C. Sativa, had antiangiogenic and antiproliferative effects. Activity THC at the membrane level, leading to disruption of membranes structure which affect the selective permeability of the plasma membrane, decrease the expression of cell-surface receptors and cell-cell communication. THC may affect the actual transport of neurotransmitters subsequently reducing tau protein and microtubule assembly (20). The aim of this study is to explore the action of C. sativa on tau and stathmin gene existing in breast cancer cell. Cannabis dry flowers and leaves were extracted at room temperature with CO2.Obtained extracts were evaporated to create a dry brownish solid. A contribution of the extract was dissolved in methanol for HPLC assay (Agilent 1100) using a C18 column (150 mm × 4.6 mm, 1 mL/min flow rate). HPLC chromatogram and composition of the main cannabinoids are reported. The MCF-7 breast cancer cell line was purchased from the national cell bank of Iran affiliated to Pasteur Institute, Tehran, Iran, and was cultured in DMEM (Dulbecco’s Modified Eagle Medium) containing 1% antibiotics (100 units/mL penicillin and 100 μg/mL streptomycin) and 10% fetal calf serum. Three passages were performed before evaluating cytotoxicity effects. All the cell culture materials were purchased from Gibco, USA. Cells were grown at the temperature of 37°C and in 5% CO2/ air. The MCF-7 cells (5 × 105) were seeded into 24-well plates and grown for 24 hours. The cells were treated with different concentrations of C. sativa extract (final concentrations 0.1, 1, 10, and 100 μg/mL) and were incubated. To evaluate the effect of CB1 receptors, extracts and cannabinoid CB1 antagonist (AM281) were administrated together. After 24 hours The cells were detached with trypsin- EDTA, then neutralized and resuspended in DMEM containing 10% FBS. Finally, cells were washed with PBS and total RNA was extracted. Total RNA was extracted from MCF-7 using an RNeasy Mini plus Kit (Qiagen, Valencia, CA, USA) following the manufacturer’s protocols. Definition of concentration of RNA samples were tested by ultraviolet absorption at 260/280 nm in NanoDrop system. The quality and concentration of the RNA samples were further confirmed by electrophoresis on denaturated 1% agarose gel. RT PCR experiment using the rotor gene 6000 RT PCR detection system (CorbetteResearch, Australia) was performed in order to determinate Tau and stathmin gene expressions. 1 µg of RNA was reverse transcribed by Quantitect Rev, transcription kit (Qiagen, Germany) and the complementary DNA (cDNA) was used for real-time quantitative PCR. The PCR assay began with one cycle of denaturation at 95°C for 10 minutes, followed by 45 cycles of 95°C for 15 seconds, 1-min annealing period of 60°C for Tau, stathmin and glyceraldehyde-3-phosphate dehydrogenase (GAPDH). Reaction mixture (10 µL) including 2 µL of cDNA template, 8 µL mixture of primers and Quantitect SYBR Green master mix (Fermentas, Germany) were amplified based on SYBR Green method. Measuring the fluorescence, produced due to SYBR Green dye binding to dsDNA after every cycle, was used to determine direct detection of PCR products. Tau and stathmin mRNA levels were normalized by subtracting CT values obtained by GAPDH mRNA. The threshold cycle (Ct) values for GAPDH and the genes of interest were measured for each sample, and the relative transcript levels were calculated by using the following equation: relative mRNA expression = 2-ΔΔCT. All samples were performed in Triplicate. The relative mRNA expression of tau and stathmin genes in cancers and normal breast was carried out by Student’s t-test in the statistical program SPSS 18.0. Significant difference level was set at P < 0.05. Tau and stathmin relative gene expressions were evaluated at different concentrations of C. sativa (final concentrations 0.1, 1, 10, and 100 μg/mL) using real-time quantitative PCR (Figures 1 and 2). The most sensitive and accurate method for the quantification of mRNA is real-time quantitative RT-PCR. It allows for the direct detection of PCR product during the log phase revealed by the incorporation of a fluorogenic molecule in double-stranded DNA. Increase in fluorescence emission is registered in “real time”, during the course of the reaction, and is a direct consequence of target amplification during PCR. Data are presented as mean ± SD, *P < 0.05. Data are presented as mean ± SD, **P < 0.005. The results are the mean of three triplicate experiments. Analysis of variance (ANOVA) was carried out by Student’s t-test and significance differences level was set at P < 0.05. 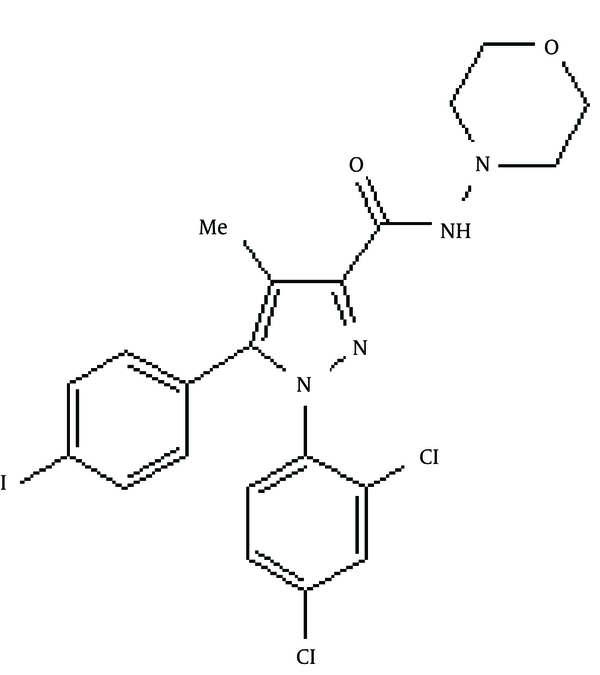 AM281 1-(2,4-Dichlorophenyl)-5-(4-iodophenyl)-4-methyl-N-4-morpholinyl-1H-pyrazole-3-carboxamide was used as potent and selective cannabinoid receptor antagonist/inverse agonist (Figure 3). The extract exhibited significant differences (P < 0.05 and P < 0.005 respectively) in tau and stathmin relative gene expression in 100 μg concentration compared to control. Although breast cancer is considered one of the most chemo-sensitive tumors, mortality still remains very high because of refractory to cytotoxic drugs such as taxanes used in breast cancer treatment (1-4). MAP-tau, endogenous regulators for stability, promotion or inhibition polymerization of microtubule, expressed in normal breast epithelial cells and breast cancer. Tau and taxanes compete for the same binding site in tubulin at the inner side of the microtubules which may lead to a taxane-resistant phenotype. Loss of tau expression may lead to microtubule susceptibility to paclitaxel-induced damage. Also, Tau can increase formation of the plasma membrane or ‘microtentacles’ on breast cancer cells which break away from the primary tumour. The microtentacles then improve the ability of the cells to attach to the walls of capillaries in the lung (5, 7-10, 21). It has been proposed that among primary breast cancer patients receiving neoadjuvant chemotherapy with taxanes, patients negative for tau expression were more likely to achieve paclitaxel treatment. Low tau expression is correlated with ER or PR negativity, and ER or PR-negative cancers are largely sensitive to taxane chemotherapy (5). Stathmin, as a crucial cytosolic phosphoprotein, controls cellular division and proliferation by regulating the running of the microtubules. Cannabinoids (the active components of C. sativa) and their derivatives have received great attention in recent years due to their applications as anti-tumour drugs (15-18). Due to the fact that cannabinoid receptors (CB1 and CB2) are overexpressed in primary human breast tumors compared to normal breast tissues, agonists of cannabinoid receptors are offered as a novel strategy to treat cancer (1, 4). Evidence suggests that cannabinoid agonists might directly inhibit tumour growth in vitro and in vivo depending on the tumour type. The proposed mechanisms are different and may involve induction of apoptosis in tumor cells, anti-proliferative action through the suppression of mitogenic signals, and anti-metastatic effect. Cannabinoid agonists have selective effects on tumour cells, comparing to normal cells (4, 17). We evaluated the effects of C. sativa on tau and stathmin gene expression in breast cancer cells. 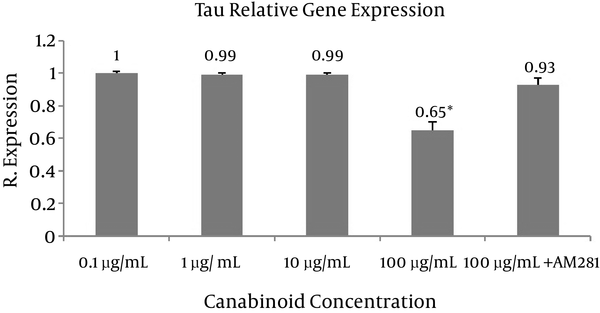 Significant differences (P < 0.05) in tau and stathmin relative gene expression following exposure to different concentrations of extract were resulted compared to the (100 μg extract + AM281) at 100 μg concentration (Figures 1 and 2). AM281, used as cannabinoid receptor selective antagonist, reversed the effects of extract on gene expression. C. sativa extract dose-dependently significantly decreases tau and stathmin gene expression, which may lead to decrease in cancer metastasis and modulate response to taxanes. Further clinical studies are needed to prove its properties. The authors wish to thank Laleh Rafiee and Hajar Naji for their kind collaboration. Funding Support: This study was funded by Isfahan University of Medical Sciences (IUMS) grant number: 293102. Conflicting Interest: We have no conflict of interest.